When the chips aren’t just down, but strewn all over the damn place, all I can ever think to do is laugh. I mean, I cry, and I whine too, but at the end of the day, I always find that laughing and making fun of a bad situation is probably going to get me to the finish line in better shape than clearing out my tear ducts. Apparently, my love for a good guffaw isn’t all in my head, either. There are a bajillion articles on how and why laughing is good for us. For instance, the famed Mayo Clinic reports that laughing has both short and long term effects. Short term benefits include, stimulating organs (no, not THOSE organs), like your heart, lungs and muscles by increasing oxygen intake. Also it increases endorphins released by your brain (think runner’s high, without all the exhausting running). Cracking up also turns on your stress response. A good harty har har, increases your blood pressure, resulting in a relaxed feeling. And it tames tension, by stimulating circulation and increasing muscle relaxation, which can reduce those nasty and annoying physical symptoms we know of as stress. Long term, watching the comedy channel can improve your immune system and actually help with fighting stress and potentially serious illness. 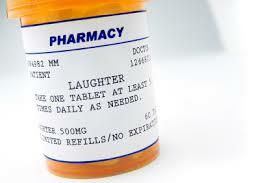 A chuckle can ease pain because it causes the body to produce its own natural painkillers. And your funny bone can actually make it easier to deal with situations you’d rather not be in. Not to mention, have you ever met someone who doesn’t love to laugh–it helps you connect with people–and that’s always a positive thing. There are even laughter clubs and laughter yoga. Yup, laughing has become a serious thing. I was raised in a family that had an exceptionally good sense of humor. And I am always drawn to people who could be professional comedians in their spare time. Maybe it’s some intuitive way that I take care of myself? Anyway, I am grateful for the ability to chortle at even the worst of it. It sure beats the swollen eyes I get when I cry. My guy has made me laugh so hard that I literally had to pull over to the side of the road because I could not drive through the tears of laughter spilling out. Laughter even has one of the best and most descriptive words: guffaw. More guffaw please — with a side of belly laughs. funny is better than almost anything i know of. in sickness and in health, forsaking all others who don’t make us laugh…..